I was playing on Bovada.lv today and found this one day Poker Tournament Series posted on their main tournament lobby. 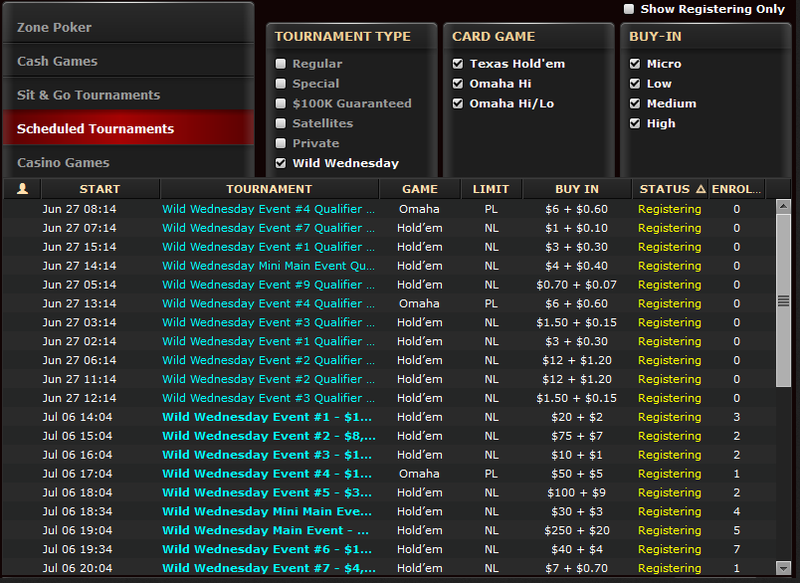 Wild Wednesday has 12 special Poker Tournaments scheduled on Bovada. 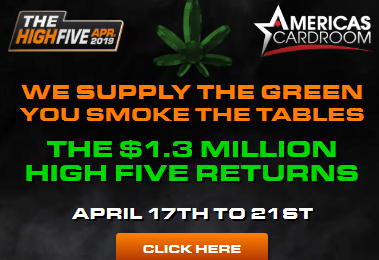 $266,000 in guaranteed prize pools and one full day of exciting online tournament poker action (all in addition to the regularly scheduled tournaments). There were several Wild Wednesday satellites (starting as low as 77¢ and $1.10 buy-ins) posted and the actual Wild Wednesday tournaments posted on the main tournament lobby. After some investigation I found and noted the details of the schedule of Events for Wild Wednesday, July 6, 2016. I hope, I don’t get in trouble for promoting this too soon, but I have detailed each of the tournaments details and have them listed below………. Event 2 4:04PM ET, $8K GTD, $82 entry, 50/50 payout, top half of finishers will win 1.5X the buy-in, top ten (final table) win larger prizes. Event 3 5:04PM ET, $10K GTD, 10K Stack /12 minute blinds, 15% of field wins cash. Event 4 6:04 PM ET, $12K GTD, $55 entry, The only Omaha event, 20 minute blinds / 7500 stack, 15% of field wins cash. Mini Main Event 7:34PM ET, $33 entry, $30K GTD, 12K stack /12 minute blinds, 15% of field wins cash. Event 6 8:34PM ET, $15K GTD, $44 entry, 6 max, 10K stack/12 minute blinds. Event 9 10:34PM ET, $2K GTD, $5.50 entry, 10K Stack / 6 minute turbo blinds, 15% of field wins cash. Event 10 11:04PM ET, $20K GTD, $60 entry, 50K stack / 3 minute ultra turbo blinds, 15% of field wins cash. Since this Tournament Series has not been announced by bovada.lv on the web, there may be some scheduling or format changes to what I have posted. Bovada.lv is one of the longest running, most reliable (for deposits and cash-outs) online poker rooms on the web. You can join Bovada for free and start playing today.